The Tennessee Advanced Energy Business Council (TAEBC) was on-site to not only see that hair in person, but to also listen to the former Massachusetts Institute of Technology physicist discuss the Administration’s “all of the above” energy policy. It was exciting to hear the Secretary gush about Tennessee’s role (in particular Oak Ridge National Lab) in meeting our nation’s energy challenges. The challenges and opportunities Moniz described are the reasons why we created the Tennessee Advanced Energy Business Council–to champion advanced energy as an economic development and job creation strategy. We might be a little biased but, we think Tennessee is uniquely positioned to meet those challenges and gain its (more than) fair share of the $1 trillion global advanced energy market. Economic assets that are unique to our state will shape the potential for the expansion of advanced energy technologies in Tennessee. Oak Ridge National Lab and the close relationship it enjoys with the University of Tennessee is certainly one of those assets. Our ability to understand what our unique assets bring to the discussion, as well as their willingness to combine these assets in support of advanced energy technologies will, to a large extent, shape the opportunities for expansion of the industry in Tennessee. That’s the role TAEBC seeks to fill. Catch highlights from Ernie’s lecture on our twitter feed (tweet from May 25 pictured below) or check out the Howard Baker Jr. Center for Public Policy website for his complete remarks. 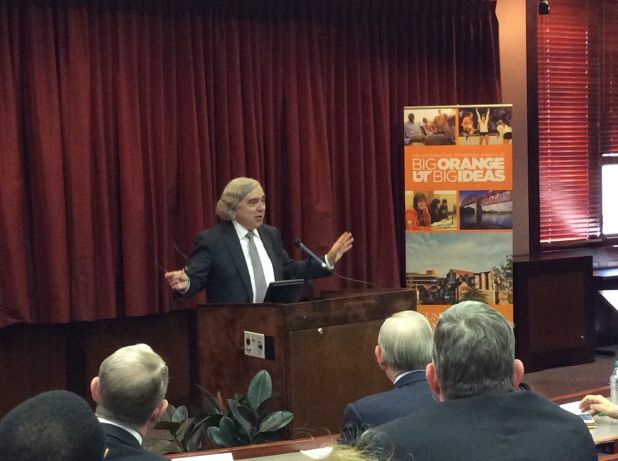 Secretary Moniz was at the University of Tennessee last month to provide the Baker Distinguished Lecture on Energy and the Environment.